Accepted Scientific Name: Rebutia spegazziniana Backeb. Kakteen-Freunde ii. No. 1, (1933); Backeb. Blatter Kakteenforsch. 1934, Pr. 2,[p. 8]. 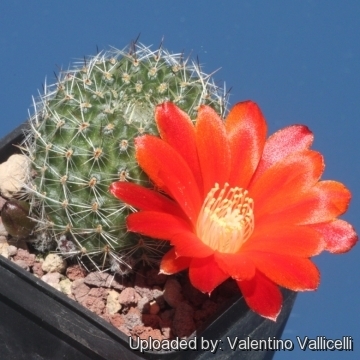 Origin and Habitat: Rebutia patericalyx has been reported from La Cueva, Chuquisaca, Bolivia. Rebutia fiebrigii var. vulpina hort. 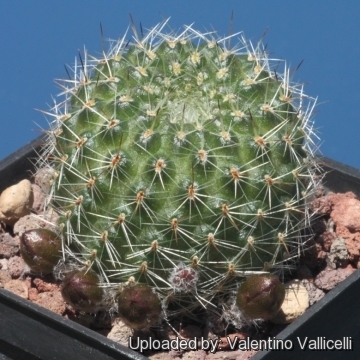 Description: Rebutia patericalyx Ritter (1977) is one of the controversial forms of the widespread and variable Rebutia spegazziniana. It is noted for the smallish solitary to sparingly clustering stems. The spines are 3 to 6mm long, pointing sideways, pale yellow to white and covered by minuscule hairs visible only under lens. The flowers are scarlet. 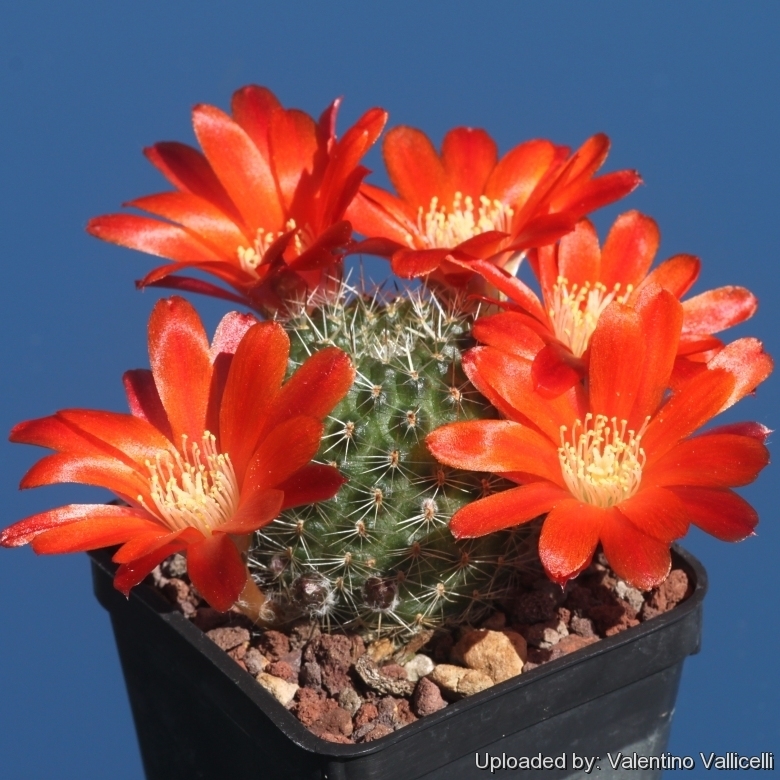 However the distinguishing characteristics of Rebutia patericalyx, appear to fall within the natural variation of Rebutia spegazziniana and most authors synonymize it with the latter, but it still has a value for a collector because they identify plants with particular characters. Regrettably most plants in cultivation under this name seldom match up to the original description, being usually raised from commercial seed which has often been wrongly identified, and this is sadly often the case with Ritter plants. Derivation of specific name: 'patericalyx', from Latin 'patera', bowl, and Latin 'calyx', calyx, cup, a bowl-shaped cup, and refers to the shape of the flower. Stems: Single-stemmed to sparsely clustering, green, 1.3 to 3 cm wide. Ribs: 13 to 16 ill-defined. Areoles: 1-2 mm long, with white wool. Flowers: Scarlet , 3.5 cm or more cm long and wide. Pericarpel with white wool and bristles. 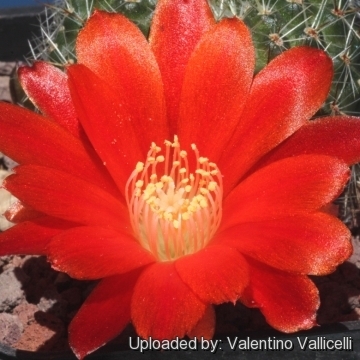 Note: Rod and Ken Preston-Mafham (1997) proposed a different classification and placed Rebutia patericalyx as a synonym of Rebutia deminuta (Web.) Br.& R.
Rebutia fusca F.Ritter: has tiny bristle spines and vibrant orange-red flower. Distribution: Oruro, Tarija, Bolivia. Rebutia mamillosa Rausch: has dark greenish brown bodies becoming bronzed purple in full sun and forms small clumps of small heads around 20 mm across. Flowers dark red, ca. 2,5 cm in diameter with showy white stamens. Distribution: west of Camargo and adjacent areas, Chuquisaca, Bolivia. Rebutia mamillosa var. australis F.Ritter: has bodies 20-30 mm wide, 10-15 ribs, 12-20 radial spines, 3-6 mm long and 0-4 centrals equal in length. Flowers 26-46 mm long with white filaments. Distribution: Habitat, San Antonio, Prov. Mendez, Bolivia. Rebutia mamillosa var. orientalis F.Ritter: has areoles abundantly filled with white wool, 0-4 radial spines, 5-7 mm long, darker at base. Distribution: Tarija towards the south, Bolivia. Rebutia patericalyx F.Ritter: has vibrant orange-red flower and tiny bristle spines covered by tiny hairs. Distribution: La Queva, Chuquisaca, Bolivia. Rebutia spegazziniana Backeb. : widespread and variable species that will clump with age and produces large and beautiful bright red flowers. Distribution: Bolivia and Argentina. Rebutia spegazziniana var. atroviridis (Backeb.) Šída: has darker bluish grey-green skin and lighter, weaker spines. Blooms dark red. Distribution: Bolivia and Argentina. Rebutia tarvitaensis F.Ritter: has grey-green to olive-green epidermis with violet tints and orange-red blooms. Distribution: Tarvita, Chuquisaca, Bolivia. 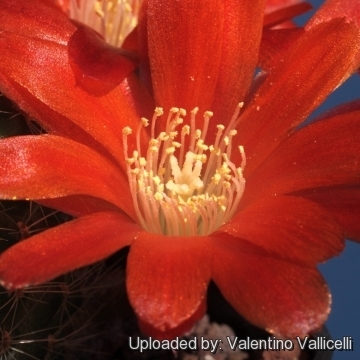 Rebutia vulpina F.Ritter: Flowers are bright red, the petals tipped scarlet, stigma and stamens white. Distribution: Bolivia, Tarija, Mendez, west of Tarija. Cultivation and Propagation: It is easy to grow and recommended for beginners. Prefer gritty, porous mix with a pH slightly on the acidic side. Full sun to light shade, Water regularly in summer but do not overwater (the root system is rot prone) and allow the pot to dry out between waterings. Keep dry in winter Hardy to -4°C it will take low temperatures when dry and do require a winter rest period. This species will occupy a small flower pot comfortably and remain a manageable sized house plant. Pest and disease: This plants are subject to mealy-bug attack and to fungus and rot problems brought about by overwatering and high humidity.